crop_rec and mlv_lite don't load when pressing the MENU or INFO button to load a config. When pressing MENU to load the config preset and after loading the crop_rec it does not load again after reboot. Somehow does not keep the settings for loading those modules. Unable to reproduce - video? The steps to reproduce are press MENU on startup to load the MENU config, after turn the module croprec, and mlv_lite on in the load modules screen. 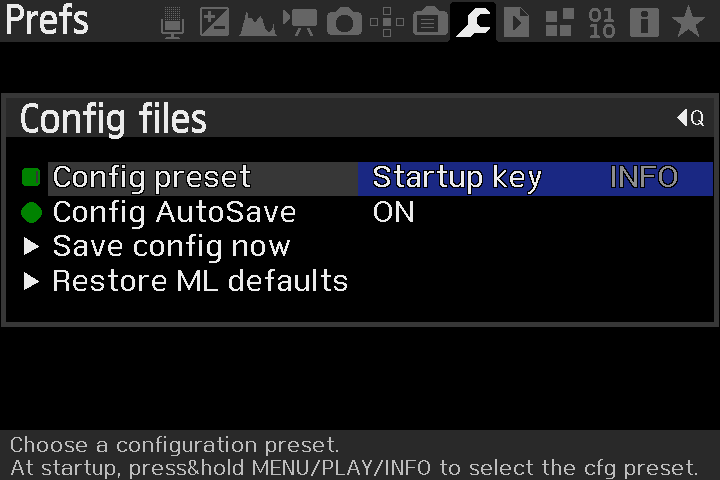 After you can save the config, it should also autosave. Then restart the camera and hold MENU now you can see that the modules are not loaded. No problems here (started from a formatted card, with current crop_rec_4k build for 1.1.3 from the download page). Can you upload the ML folder contents so I can try to reproduce with your config? Still unable to reproduce. I doubt the firmware version makes a difference, but who knows. Just to exclude filesystem corruption: card was formatted before running the test? I downgraded to 1.1.3 and formatted using fat32 then used the latest experimental build crop_rec_4k (2017-10-10 21:51) and it still does not keep the config settings. the module crop_rec and mlv_lite dont load on startup when pressing INFO. Even when I say load on startup when in the INFO config. Is there something I need to edit in the INFO.KEY file in the SETTING folder? Reproduced with the files from your zip. Card formatted as exfat with card_fmt, copied autoexec and 5D3.113.sym from Jenkins. Update, the first time I formatted in the camera but magic lantern reinstalled itself. I formatted again on the computer, and now with firmware 1.1.3 and formatted using fat32 is does keep the settings, and also loads the crop module. Then I tried again but now with exfat and the problem comes back. So yea I think its an EXFAT issue in combination with the config setting. Yes its resolved with the new fixes, I just tested on 5D 1.1.3 and 1.2.3 both with EXFAT.